I'm trying to figure whats the best traits to look for on: Warrior, Scout,Shooter and Bruiser. I'd really like to get your adivce. for Scout i think: lucky/dodge/ retaliate/power strike/strong, what do you say? my best bruiser is punish/retaliate/iron skin/lucky/power strike. is that good or should look for another? tytyty was looking for something like that, didnt find, guess I wasnt looking good. btw for badges for each class what do you recommend? Most people say it's my blue eyes. You NEED ruthless on a scout. The bruiser you have is badass though! Here are what I consider perfect traits for each of those classes. @crambert_nec Not a fan of retaliate for scouts? What's your logic behind that? I have 2 good scouts with great traits but don't have retaliate. so i got that scout now: strong, ruthless, power strike, lucky,retaliate. i think thats nice no? She has served me well in Challenges through RSL 31.2 as well as almost every outpost raid she has gone on. Blenda is a heroine found in Swedish myths and legends. It is unclear as to exactly when she lived, but according to the legends, her heroic deeds took place during the time when Alle was the King of the Geats, which is assumed to have been at some point between the 6th and 8th centuries AD. Blenda is remembered for her courage (and cunning) in leading a group of women against an invading Danish army. @psychwolf It's a good trait but I'd rather have the other 5. 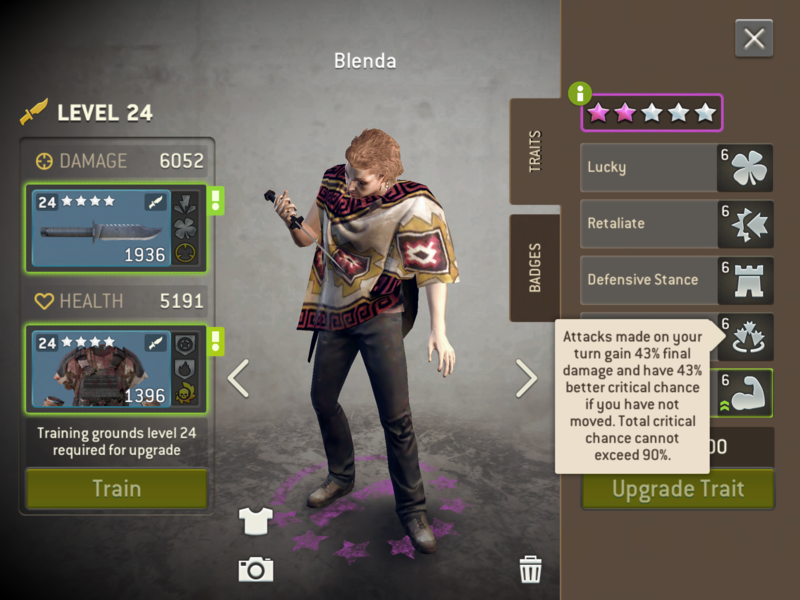 I badge my scouts 100% offensively for maximum damage so basically any level 31+ walker attack will instant struggle making retaliate a wasted trait. I wouldn't say ruthless is needed on every scout. You need a ruthless scout, I'm not disputing that. But for many melee friendly maps I use Michonne and 2 scouts and quite a few of these have no tanks on them. Being able to hit ungodly amounts of damage is vital for the distance, but for the challenge, not always. You only really need a strong brain stab if there are high level tanks on the map and in that situation you don't need both your scouts geared up for max damage. And what do you consider a good offensive scout? and which badges for each build? 5th trait could be a wild card. Maybe beef up some damage with strong or ruthless. Vigilant or power strike could be good here as well. Badge an offensive scout with 3 damage and 3 critical damage badges. Defensive scout with 3 damage reduction and 3 health badges.